Mograni & Manbell Devons has 50 studs and another 110 commercial breeders on its 1100 acre property at any one time. All of its animals are performance recorded through the Devon Group Breed Plan. At Mograni & Manbell it is believed that all genetics offer their benefits to the Devonshire cattle breed. With this in mind its bulls are not selected to be particularly lenient towards any specific breeding and a variety of sires are used. 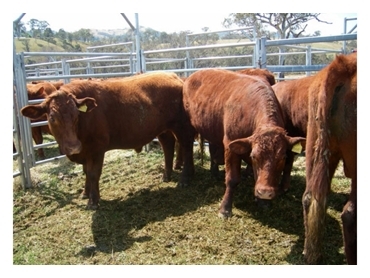 Mograni & Manbell also uses Limousin and Shorthorn genetics, alongside its registered herd, in order to increase muscle and size for the commercial market. Devon cattle are predominantly found in south eastern Australia but are also spread across the country and are known for providing exceptional results for the beef industry, both as pure breds and cross breeds. Devon cattle is one of the oldest breeds in existence, developed in Devonshire, in south western England, and are traditionally used solely for their beef. Some parts of USA also occasionally use Devon cattle as a dual purpose breed. Visit the website for more information about Mograni & Manbell’s herd, open days and bulls for sale.